Welcome to the most important article I or anyone can ever write about fishkeeping: the aquarium nitrogen cycle. Contrary to what you may hear at a pet store, it is not just filling your aquarium and running the filter for a week. The nitrogen cycle is how we maintain a healthy environment, and it surprisingly relies completely on bacteria. These microorganisms change the toxic waste of our fish into a relatively harmless substance, thereby allowing us to keep fish in contained areas. In the wild, the fish waste is diluted by the humongous volumes of water. The cycle begins with fish. They produce ammonia as a byproduct of their metabolism. The problem is ammonia is toxic to them (and us for that matter). Luckily a genus of bacteria called Nitrosomonas exists. These bacteria take ammonia and convert it into nitrite to generate energy for themselves (much like plants use photosynthesis to generate energy from the sun). However, nitrite is still toxic to fish. That’s where second genera of bacteria called Nitrobacter and Nitrospira come in. They convert the toxic nitrite into nitrate which takes much higher levels to reach toxicity. However, nitrate is still toxic to fish and will need to be removed from the aquarium by its caretaker. This is one reason we perform periodic water changes on our aquaria. Nitrobacter and Nitrosomonas also have requirements just like our fish. They live on surfaces in your aquarium although a small amount can be found floating in the water. They operate best between the pH’s of 6.0 and 9.0 and need water above 50F. They also require highly oxygenated water, so they are most commonly found in the filter. For this reason, it is important to never wash your filter media in chlorinated water. When plants are added to an aquarium, they use up nitrogen in all three of the forms (ammonia, nitrite, and nitrate). If enough fast-growing plants are present, there may be very little ammonia that makes it to the filter. However, even with a planted aquarium, I recommend having some type of filter where these important bacteria can grow. Plants can be finicky and stop growing for odd reasons, and when that happens an ammonia spike can be deadly to fish and invertebrates. 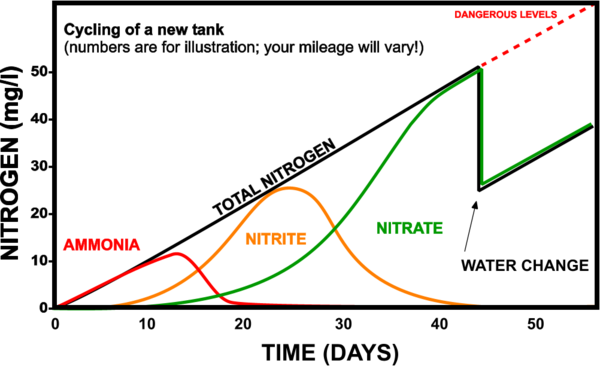 Having plants does not negate the necessity of the nitrogen cycle in your freshwater aquarium. Cycling an aquarium takes weeks to a month because the colonies of bacteria replicate slowly. Nitrosomonas need a source of ammonia to produce nitrite before Nitrobacter can begin to grow. The only way to know when it is complete and what stage you are in is to test for ammonia, nitrite, and nitrate. First you will see an ammonia spike, followed by a nitrite spike, and then nitrates. You should test your water daily and record your results to chart your progress. A few different methods of getting ammonia into your aquarium and starting the cycle are detailed below. This is the most common and oldest method. Simply throw the fish in and hope for the best. The bacterial colonies will build up over time, but while you are waiting your fish will be subject to ammonia poisoning and nitrite poisoning in the weeks it takes the Nitrosomonas and Nitrobacter colonies to establish themselves. This is how many ignorant aquarists (including myself) originally establish a cycle, however it is not the most humane. Other alternatives should be explored first. In addition to living fish producing ammonia, decaying food will also produce ammonia and can be used to start a cycle. You can use fish food or raw seafood. However, this method isn’t without risks as rotting food will attract other bacteria and fungi. If you are using this method, you need to do a large (70% or more) water change before you add fish and invertebrates. You can find this sold as a cleaning agent in many stores. Just make sure you check the label because the ones with surfactants will not work. Add the ammonia to your tank water until you get a concentration of 3ppm (any higher and it will inhibit the Nitrosomonas). When the ammonia concentrations drops to zero and you see nitrites, add more again. Keep doing this until adding ammonia produces nitrates. You will have to keep dosing the tank until you add fish to sustain the colonies. Before you add fish, do a water change to reduce the nitrate levels to below 40ppm. If you have a friend or store you trust, you can ask for some of their filter media to add to your filter. Because these bacterial colonies are most commonly found attached to filter media, you will instantly establish a cycle. You can add fish the day you add in the media. If you have multiple tanks you can borrow media from one tank to cycle another. Since I cycled my first aquarium, I have used this method exclusively to cycle my tanks. Nitrosomonas and Nitrobacter can be bought from pet stores and online. A few select products are believed to work quite well. Dr. Tim’s One and Only and Tetra Safestart are two that are claimed to work wonderfully. By adding these products you can cycle your tank instantly and add fish that day. You can also use these products in conjunction with any other method to increase your chance of success. I have not personally used these products at the time of writing, however I have heard amazing reviews from others. I do have plans to try these products myself one day. Cycling an aquarium is the single most important thing you can do for the health of your fish. It is time and effort, but it is worth every minute for the headaches it will save you. The best medicine is clean water, and that is just what a cycle gives you. “Ammonia & the Nitrogen Cycle: Important Steps for YourAquarium.” Drs Foster and Smith. www.drsfostersmith.com. Updated: 18 October 2015. Retrieved: 18 October 2015. “Aquarium Nitrogen Cycle.” Fishlore. www.fishlore.com. Updated: 30 September 2015. Retrieved: 18 October 2015. DeLong, D.P. and T.M. Losordo. 2012. "How to Start a Biofilter." Southern Regional Aquaculture Center. Retrieved: 18 October 2015. “Fishless Cycling.” Algone. www.algone.com. Updated: 15 March 2012. Retrieved: 18 October 2015. “’Fishless’ Cycling.” The Skeptical Aquarist. www.skepticalaquarist.com. Updated: 21 March 2011. Retrieved: 18 October 2015. Helm, Ben. 2014. 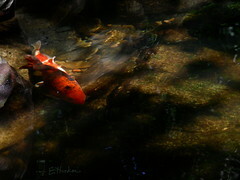 “Controlling Ammonia in a Fish Aquarium.” www.fishchannel.com. Retrieved: 18 October 2015. Losordo, T.M., M.P. Masser, and J. Rakocy. 1998. "Recirculating Aquaculture Tank Production Systems: an overview of critical considerations." Southern Regional Aquaculture Center. Retrieved: 18 October 2015. Monks, Neale. 2011. “FishlessAquarium Cycling Method.” www.fishchannel.com. Retrieved18 October 2015. “Nitrifying BacteriaMixtures Work.” Dr. Tim’s Aquatics. www.drtimsaquatics.com. Updated: 8 September 2015. Retrieved 18 October 2015.